If you’re like me, you’re gearing up for Cyber Monday. Once Thanksgiving hits I avoid all stores, with the exception of the grocery store and few local independent businesses, like the plague until about mid-January when one can only hope the Santa’s and mobs of crazed looking people are gone. Here are some of my favorite online retailers sure to have some pretty good deals in the weeks to come. Loving Eco is my favorite of the Groupon spin-offs. Though not all of the products they sell are vegan, they do sell quite a few vegan products and they clearly mark them with a V. They also mark which items are organic, fair trade, cruelty free, handmade, energy efficient, biodegradable, etc. A percentage of each sale on Loving Eco goes to charities, which change on a weekly basis. Among vegan charities that have benefited from Loving Eco are Mercy for Animals and Farm Sanctuary. If you sign up for their site, you’ll get a weekly e-mail featuring the deals of the week. This week they have select Matt & Nat bags and wallets on their site at a 45% discount! Vegan Cuts is another Groupon-like discount site for vegans and they’re compiled this great Holiday Gift Shopping Guide, which includes several coupon codes! Subscribe to their site and you, too, can enjoy their weekly deals. Rescue Chocolate – If you’re looking for something sweet for your loved ones, nothing beats Rescue chocolates. They’re vegan and all profits go to animal rescues. Need more ideas? Check out Vegan Mainstream’s Holiday Gift Guide. Last Thursday, El Nuevo Mexicano (2914 N Clark Street, 773-528-2131) premiered their new vegan menu with a benefit for Mercy for Animals. Nick and I were so excited we made a reservation a week in advance in order to make sure we’d get to try it out. 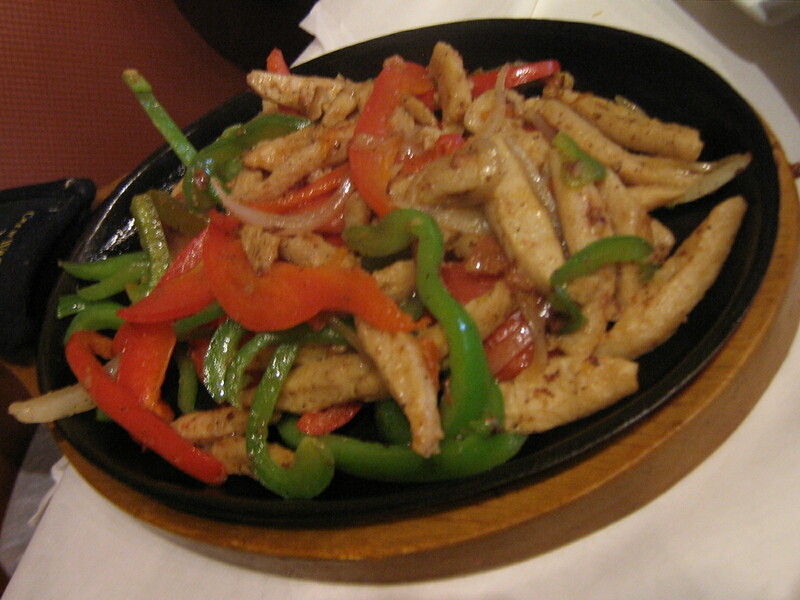 El Nuevo Mexicano, is a small restaurant which has been serving Mexican food in Lakeview since 1983. I had never been there until last week, because my family typically went to the Little Village to get Mexican food when I was growing up, so I wasn’t sure what to expect (other than that their vegan menu would include Daiya cheese and Upton’s Naturals seitan). Since we knew we would be reviewing the place and part of the proceeds were going to charity we decided to go all out and get an appetizer, 2 entrees and a dessert. We chose the Botana Combinada, which consists of two flautas filled with Upton’s chorizo, carrots and potatoes served with guacamole. It was delicious! I liked it so much I wasn’t entirely sure I’d made the right call not ordering the Flautas de Verduras con Papa y Chorizo Vegano as my entree (next time!). 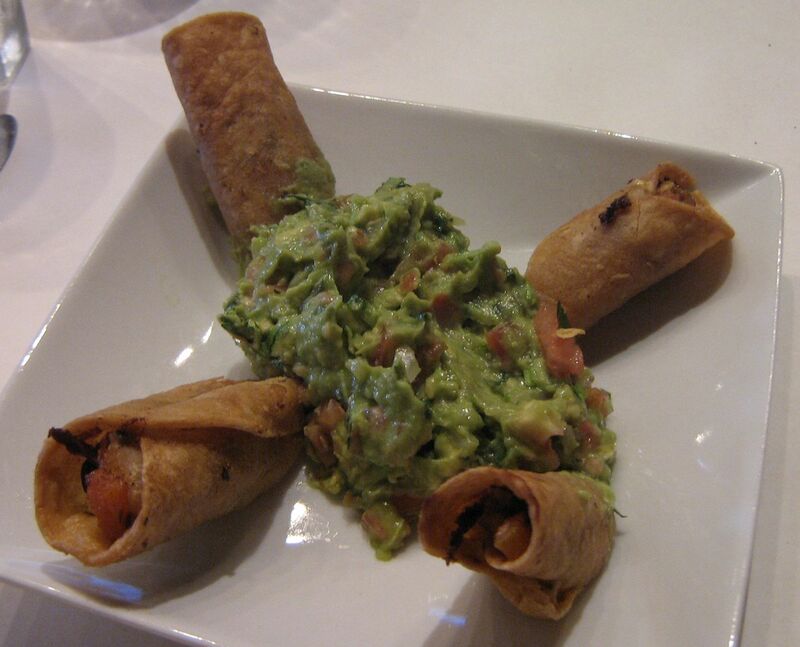 The flautas were flavorful and they weren’t bathed in grease, which can often be the case. The guacamole was fresh and we had an abundance of tortilla chips and salsa to finish off what we didn’t eat with the flautas. I ordered the Enchiladas de Verduras en Salsa Bandera, which consisted of three corn tortillas stuffed with grilled peppers, mango, plantains, pico de gallo and Daiya cheese covered in chipotle and tomatillo salsas, served with rice and a salad made of fresh greens, jicama, strawberries and mango drizzled with a vinaigrette. I was not disappointed with my choice. I am not someone who shies away from mixing sweet and savory foods or sweet and spicy foods, if you are then this may not be the best entree for you to order. However, neither flavor overpowered the other, which is often what turns people off to such combinations and together the fruits, vegetables and salsa made a unique, healthy, delicious meal, which I look forward to eating again soon. Nick, ordered the Fajitas Vegano, which consisted of sauteed onions, peppers and seasoned soy strips, served with quinoa, beans, guacamole, pico de gallo and warm corn tortillas. His entree was almost enough food for two people. He asked for the quinoa, which was seasoned like Spanish rice (yum!) instead of rice. After trying my entree and our appetizer he was a bit disappointed with the fajitas, because though they were good, he wasn’t blown away by them. He was scared away from some of the other entrees, because unlike me, he’s not really into fruit, so the idea of eating entrees which mixed fruit andspicy/savory things was a bit daunting, so he went with the safe choice. 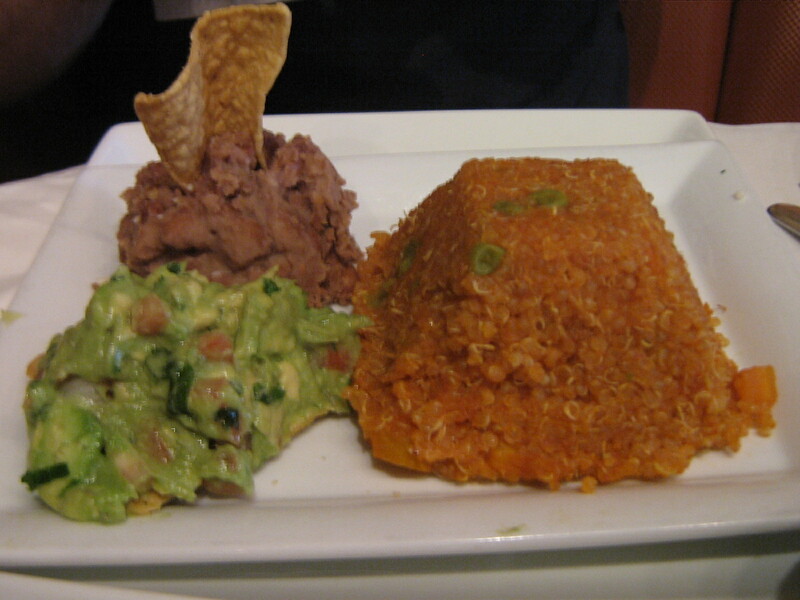 What he got was something we could have easily made at home, though, I had never thought of preparing quinoa like Spanish rice. We decided to split a dessert, because, Nick’s, entree was so large he wasn’t able to finish it all. At the time the only vegan dessert available was the Chimichangas de Camote en Chipotle Durazno Salsa, so we went with that. 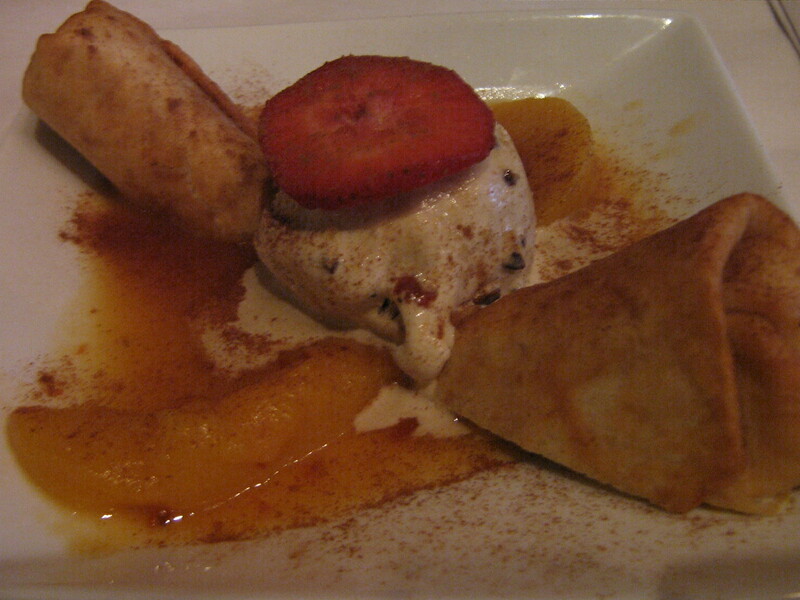 The chimichangas were flour tortillas filled with mashed sweet potatoes, served with a scoop of vegan ice cream and drizzled with warm peaches, chipotle powder and raisins. The chipotle powder gave the dessert a little kick and the neutral flavors of vanilla ice cream and sweet potatoes went nicely with the spiciness of the chipotle and the sweetness of the peaches. Overall it was a very pleasant dining experience. The wait staff were friendly and attentive, never letting our water glasses go dry. The restaurant was cozy and not too loud, and the food was delicious. I’m looking forward to going back and trying more of the vegan menu. Though, we made a reservation, they are not required as the restaurant is pretty casual. Entrees range from $12-$15, which means it won’t be a weekly joint for us, but it also means it’ll be the kind of place we visit more than twice a year. 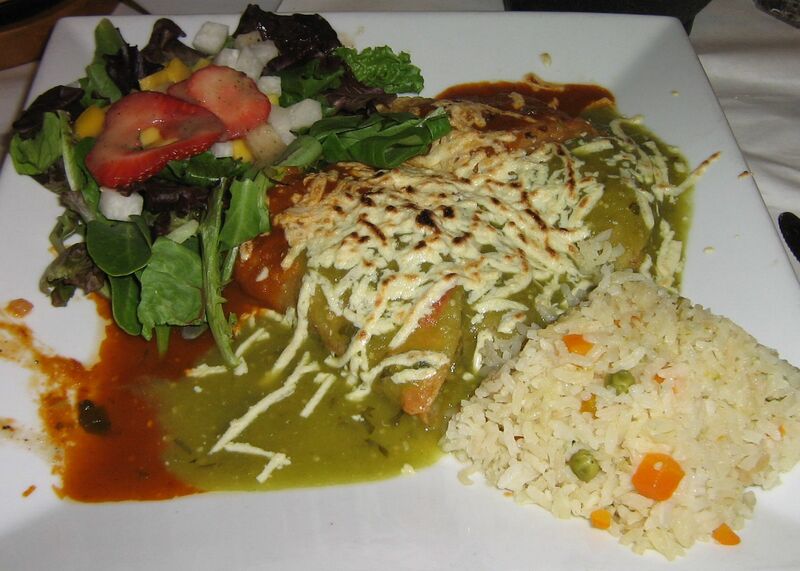 According to their Facebook page, El Nuevo Mexicano, will be adding/changing items offered on the vegan menu periodically, so check back often to see what new delicious treats are being offered! For those who are interested, they also offer drink specials 5 nights a week and can be booked for parties. Just remember to ask for the Vegan Menu. 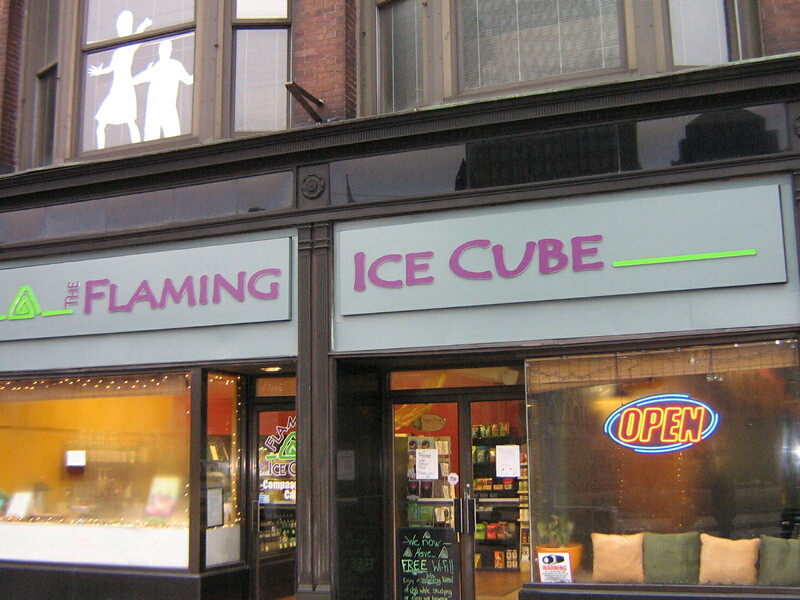 The Flaming Ice Cube is a vegan cafe located in downtown Cleveland, Ohio, across the street from Public Square. They offer standard cafe fare, including soups, salads, sandwiches and entrees, as well as coffee, smoothies and juices. I ordered the Mmmushroom Burger, which came with one of the sides of the day. The sides for the day were cous cous, black bean and corn salsa, and a pineapple raisin salad. My first choice was the cous cous, but they were out, so I went with the black bean and corn salsa. The salsa was like pico de gallo, it included black beans, corn, tomatoes, green bell peppers, a little lime juice and some spices. The vegetables were very fresh and it was nice to have a healthy side instead of a pile of fries (which I love) or a bag of chips. The Mmmushroom burger proved to be an excellent choice. The patty was thick and juicy. 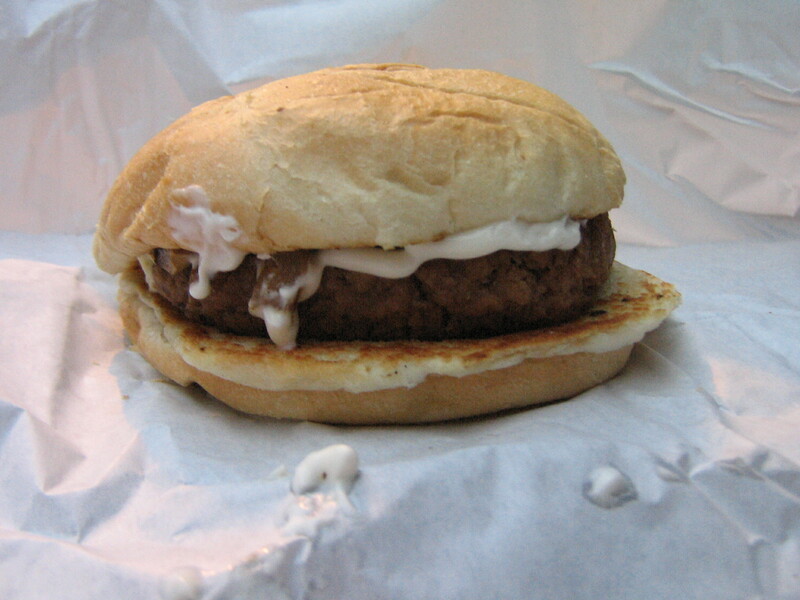 It was topped with sauteed mushrooms, Daiya Mozzarella cheese, mayo and sauteed onions. The mushrooms were cooked perfectly, they weren’t slimy and they added just the right amount of flavor to the burger. If you ever find yourself near Cleveland, OH be sure to stop by and try one of the delicious handcrafted burgers or one of the many other items on their menu. Next time I’m in the area I think I’ll try out the Hula Burger, which is topped with grilled pineapples, peppers, onions, mayo, lettuce and cheddar – yum! When I walk into a new place sometimes I like to ask what the house favorite is. The girl behind the counter after some degree of thought responded that the Pizza Burger was very popular so I ordered that. After sitting down in the car with our respective sandwiches I took a bite of each. In all honesty I was a bit disappointed I didn’t get the Mmmushroom burger. The mushrooms, onions, and Daiya had a lot more pizazz than the burger I got. 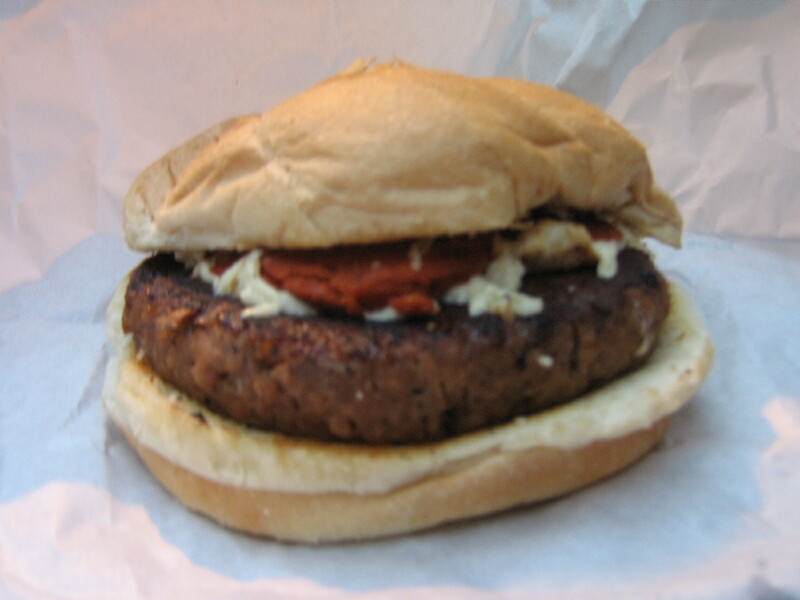 The Pizza Burger was supposed to have marinara, Daiya mozzarella, and pepperoni. Unfortunately there was very little in the way of marinara and the pepperoni overpowered everything. Unlike the Mmmushroom Burger, the Pizza Burger tasted like generic store bought faux meat & cheese items just thrown together. I was definitely jealous of Lisa’s selection. You win some – you lose some. Like Lisa, I was a fan of the corn salsa on the side. 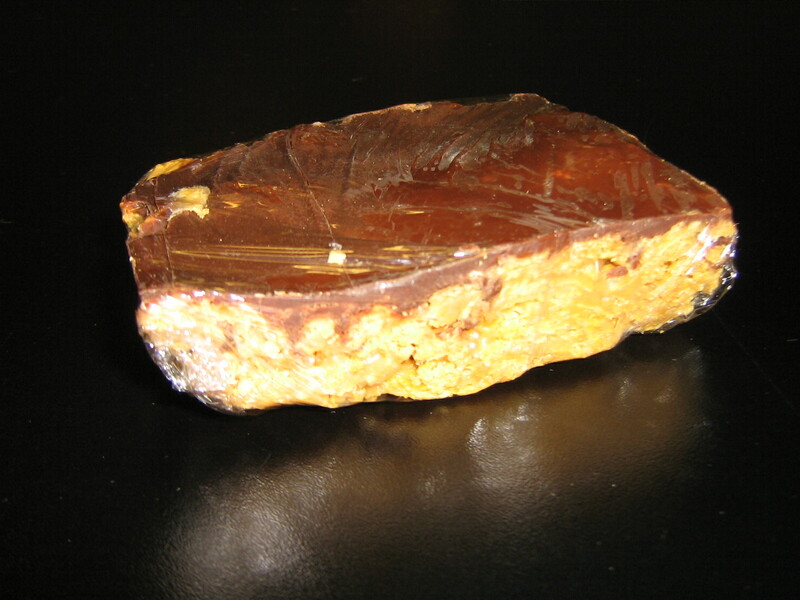 The unique highlight of the visit was the Peanut Butter Crunch Bar which was a peanut butter rice crispy treat with a layer of chocolate on top. Simple but effective. Delicious! My roommate’s girlfriend and I made these recently and they were awesome, especially since they don’t involve any baking (unless you decide to make your own cookies for the crumbs, which is what we did). We made “Soy Milk’s Favorite Cookie” from Kelly Peloza’s The Vegan Cookie Connoisseur for the crumbs. We also used crunchy peanut butter. 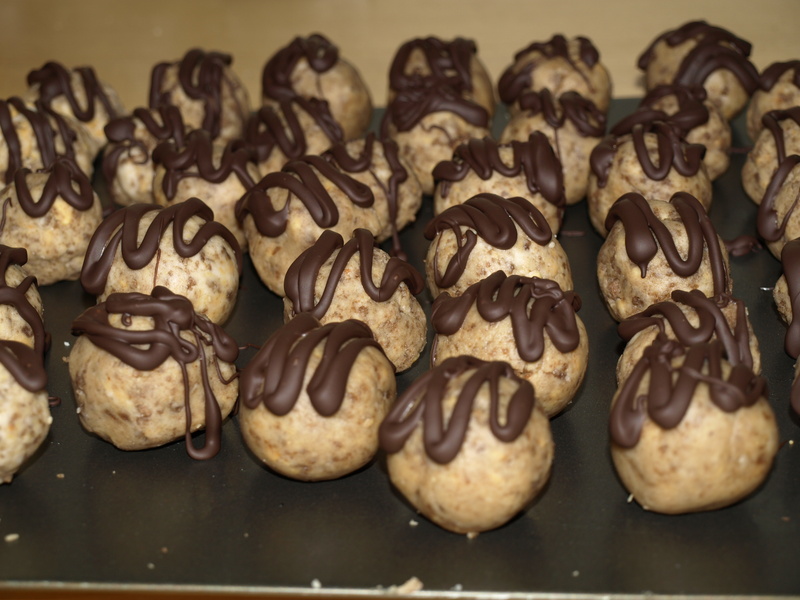 The recipe made about 3 dozen balls which didn’t last very long thanks to all of the chocoholics in our house! So far 2011 has not been a good year for vegan and vegan-friendly restaurants in Chicago what with Life on Mars and Veggie Bite closing. The latest casualty of the recession appears to be Earwax Cafe (1561 N. Milwaukee Avenue, 773-772-4019). According to the Wicker Park Bucktown Indsider’s Guide, Earwax will be closing it’s doors for good after 20 plus years of business on Feb 28, 2011. Earwax Cafe seems to polarize people almost as much as Soul Veg does, I’ve always been a fan of both establishments, though, and am sad that I’ll be eating my last meal at Earwax this week. If you’re also a fan, make sure you stop in and show the staff and owners your support this week. This week Veggie Bite (1300 N Milwaukee Ave, Chicago, IL) closed it’s doors. I spoke to Sylvia, one of the owners, and it sounds like Veggie Bite will still be around in some shape or form (like at your local grocer perhaps?) and they may even return to the restaurant business at some point in the future. I’m sad to see them go. I will miss the chix-free nuggets and their shakes. Here’s to hoping they make a comeback soon! In the meantime, they’ll be keeping their facebook page up, so check there often for updates. Is only 10 days away. Want to get that special someone a tasty, ethically produced treat? Check out Food is Power’s article on fair trade vegan chocolate. Also, check out Rescue Chocolate – all proceeds go to animals shelters and their chocolates are delicious! Better yet, type in Broad Shoulder’s Animal Rescue or One Tail at a Time’s name when you send your payment in before Valentine’s Day and these local shelters will get a percentage of the profit.